A few years ago on New Year’s day, this soup saved my life. This isn’t an exaggeration: the excesses of the previous night had led me to such exquisite agony that it took everything out of me just to make it to the living room sofa. I couldn’t handle daytime TV. Music was out of the question. I couldn’t even face a bacon sandwich. If you know me at all, you’ll recognise this as time to order last rites. Fortunately, CB was on hand with this soup. 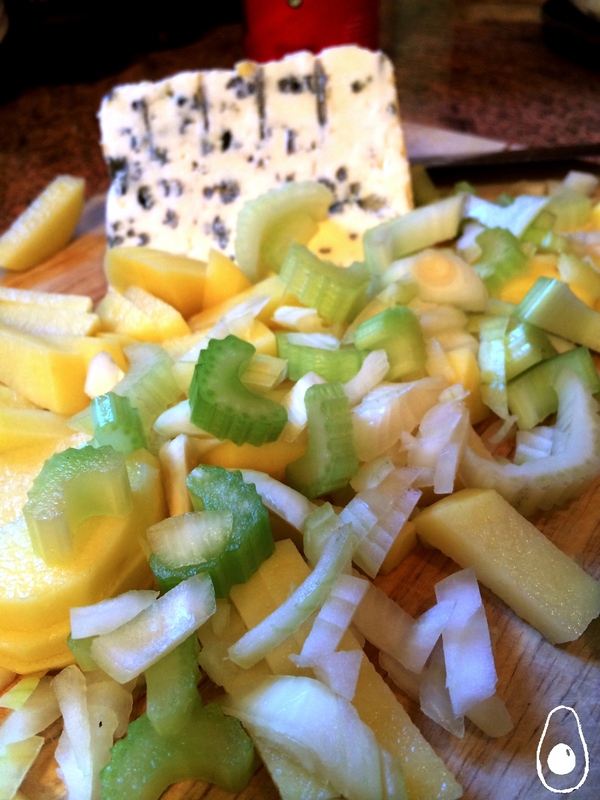 At first, as she delivered this news (very softly and in even tones, so my head wouldn’t split open), I baulked at the idea of a creamy, cheesy soup. Turns out she was bang on the money. This soup is rich and flavoursome and works great for a winter treat during the holiday season. The celery cooks down and adds a great base flavour without leaving any trace of its original flavour (which is exactly how we like it). 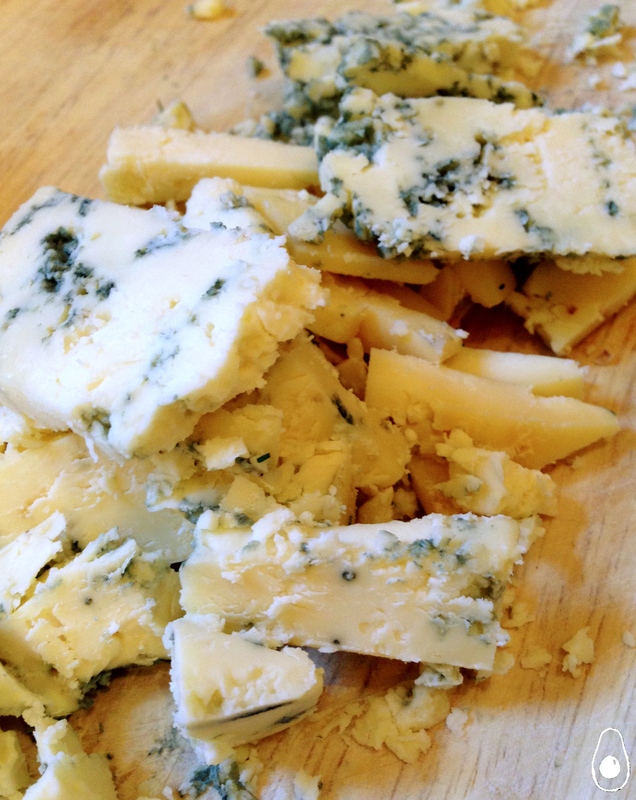 Use any blue cheese you’re fond of; our favourite is a very strong stilton that’s got more blue than cheese. My one serving tip is as follows – don’t eat this with a simple roll. Make yourself a fish finger sandwich to be served on the side: cheap, thick white bread, plenty of spread, plenty of vinegar, a suggestion of tomato ketchup. I dipped the corner of the sandwich in the soup and put it in my mouth and in that moment I knew I was going to live to see another New Year’s Day. Melt the butter over a medium head and gently fry the onion, potato and celery in a heavy bottomed sauce pan with the lid on for 3-4 minutes. Add the stock and bring to a simmer. Cover again and cook for 30 minutes. Take the soup off the heat and add the cheese. Blend using a hand blender until smooth. Put the saucepan back on a gentle heat, taste and season. When the soup is completely heated through, serve with a fish finger sandwich and an enormous vat of tea. Wow this soup sounds delicious, I can just imagine how those flavours come through. I definitely would never have thought of a creamy cheesey soup for a hangover cure, but I’ll have to keep it in mind! Thanks so much for sharing with us at Fiesta Friday, better save a few bowls for those of us that over indulge on MB’s cranberry mojitos!